On December 23, 2009, the United Nations Security Council adopted Resolution 1907, imposing a sanctions regime against Eritrea. The pretexts for the sanctions were Eritrea’s alleged support for Al-Shabaab, a Somali terrorist group, and its dispute with neighbouring Djibouti. Shortly thereafter, in 2011, the sanctions were expanded through Resolution 2023 (2011), adopted by the Security Council during its 6674th meeting, held on December 5, 2011. Importantly, these are not breaking developments. Over several years, a long series of UN Somalia Eritrea Monitoring Group (UN SEMG) reports have consistently concluded that they have found “no evidence of Eritrea’s support for Al-Shabaab,” while in 2010 Eritrea and Djibouti signed a comprehensive agreement entrusting Qatar to play a mediating role, quickly followed by a process of implementation. According to Herman Cohen, former US Assistant Secretary of State for African Affairs, the sanctions on Eritrea have “no basis in fact,” are a case of “bullying,” and while 14 Security Council members wanted to lift the sanctions in 2014, the US vetoed the move. It is quite telling that although the US recently appointed a new Charge d’Affaires in Eritrea, accompanied by a series of platitudes, on September 29, mere days after the arrival of the new Charge d’Affaires in Asmara, the US updated unilateral sanctions against Eritrea in the US Federal Register. The continued illegitimate sanctions against Eritrea, largely due to pressure from the US and several partners, add to the long list of general criticisms and troubling questions often raised about the use, legitimacy, poor execution, and overall effectiveness of international sanctions. In fact, many studies have found the success rate of sanctions to be poor (Pape 1997; Baldwin and Pape 1998; Allen 2005; CFR 2006; Spadoni 2010). The checkered history of sanctions is probably best reflected in Iraq, where a study by the United Nations Children’s Fund (UNICEF) found that between 1991 and 1998, during the height of the Iraqi sanctions regime, there were 500,000 “excess” deaths of Iraqi infants under the age of five (“excess” meaning deaths that would not have otherwise occurred in the absence of the sanctions regime). Denis Halliday, a distinguished senior UN official assigned to Iraq who ultimately resigned in protest, described his assignment as, “to implement a policy that satisfies the definition of genocide: a deliberate policy that has effectively killed well over a million individuals, children and adults.” Later, the UN Assistant Secretary General, Hans Von Sponeck, who additionally served as UN Humanitarian Co-ordinator in Iraq, stated, “[M]ake no mistake, this is deliberate. I have not in the past wanted to use the word genocide, but now it is unavoidable,” before also resigning. A number of other problematic cases (e.g. Cuba) have meant that sanctions have an inconclusive track record and remain plagued by considerable questions about their utility. Additionally, the sanctions also reflect a blatant double standard. It is hard to overlook the troubling paradox that while Eritrea remains burdened by sanctions—even, as it must be underscored, in the absence of any supportive evidence for their pretext—the UN and the international community have long ignored its neighbour Ethiopia’s complete failure to abide by its international legal obligations and responsibilities for demarcating the border, and its ongoing military occupation and state of war and aggression toward Eritrea. Moreover, in a twisted case of illogic, Eritrea is doubly punished since the sanctions (particularly the arms embargo and severe limitations on defensive materials) effectively mean it is restricted in defending itself—a fundamental international right enshrined under the UN Charter—against Ethiopia’s military occupation and unrelenting aggression or terror-related threats which abound throughout the region. Only this past summer, on June 12, 2016, in a clear illustration of the double standard, the Ethiopian military launched a large, unprovoked attack against Eritrea on the Tsorona Central Front, leading to the death of hundreds of Ethiopians and 18 Eritreans. Aggression, it should be recalled, is a grave breach of international law and the UN Charter, and was described by the Nuremberg Tribunal as “not only an international crime; it is the supreme international crime”. 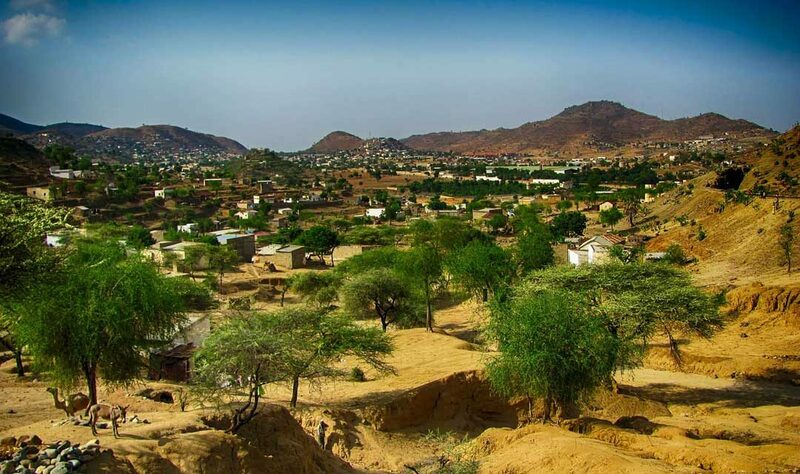 Although Eritrea immediately reported the incident and quickly called upon the Security Council to investigate and take appropriate action, it was only met with tepid responses by the UN Secretary General, which meekly called for “restraint” from both sides. Beyond representing a resounding failure to condemn Ethiopia’s continued belligerence and uphold international law, this unjustly assigned equal blame to both victim and aggressor. Rather than an isolated incident, the June attack was but the latest in a long series of deadly provocations by Ethiopia. Since the end of the destructive 1998-2000 war between the two countries, the Ethiopian government has not only made regular illegal incursions into and attacks against Eritrea, it has also made persistent calls for the overthrow of the Eritrean government and, through belligerent, threatening statements via government-owned media outlets, proclaimed its intentions to carry out “military action to oust the regime in Eritrea”—again, violating the UN Charter and international law. In 2014, Ethiopia’s Prime Minister, Hailemariam Desalegn, stated that the “no war, no peace situation with Eritrea is over. Ethiopia from now on is ready to take military action against Eritrea,” while in 2015 and early 2016, he claimed Ethiopia was ready to take “proportionate military action against Eritrea.” As well, shortly after the disastrous June 2016 attack, high-level Ethiopian officials (including the Prime Minister, Minister of Defence, and Minister of Government Communication) proudly boasted in parliament about Ethiopia’s aggressive actions against Eritrea (including statements made on 14 June, 28 June, and 5 July 2016).